The announcement doesn't necessarily mean we're going to see Android Q GSI images being pushed out before Google's typical Developer Previews by any means, but it does mean more devices will be able to get in on Android Q early, and we may see ROMs based on those stock GSIs hit Treble-compatible devices. Usually, Google doesn't publish buildable GSIs before an update formally hits AOSP (which is typically much later). We are also exploring ways to make future GSI available earlier than the release of next Android version. So you will be able to try out next Android version earlier over GSI, and at the same time we can get early feedback from you, so the benefit is mutual. So please stay tuned for our further announcement on this. Curiously, Google also has an "idea of trying out GSI without actually flashing GSI onto the device," though specific details weren't provided. It's not just an idea either; apparently, Google had a proof of concept working prototype at the event. If that can mean getting stock Android onto a bootloader-locked device, sign me up. For more details on precisely how GSIs can help developers, check out XDA's coverage of the subject, which goes into more of the nitty-gritty. 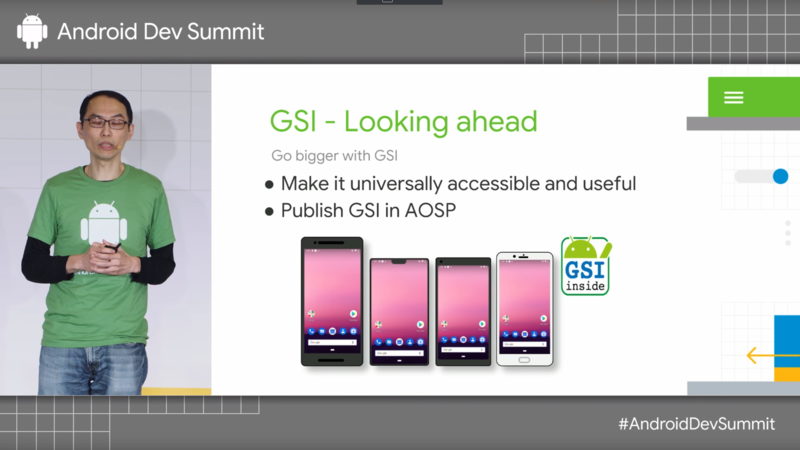 "... GSI could enable early access to future Android platform builds that you can run on a Treble-compliant Android 9 device, so you could start app development and validation before the AOSP release." The company goes on to talk about how positively drenched we're all going to be in Treble going forward, with the framework required for all phones launching with Android Pie on board.